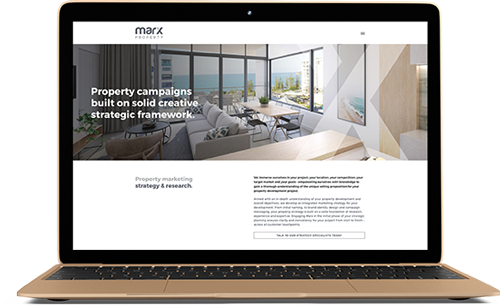 At Marx, we combine the creative strength of over 20 years of large agency experience with the personal attention of a boutique studio to execute fully integrated, marketing and design campaigns across South East Queensland. We are commercially driven and work passionately on behalf of an incredibly diverse range of clients who value our experience and full service in-house capabilities. We strive to increase our Sunshine Coast and Brisbane client base with effective communication in graphic design, brand creation and website development while providing valuable experience in campaign strategies, competitive positioning and printing. From logo design to advertisements, brochures to digital campaigns, we take care of the marketing and advertising needs from start to finish. In addition to our diverse client base we have established a niche market in the building and property development industries and have recently launched a dedicated website to promote these specialised services. This dynamic role will suit an energetic, strategic thinker with solid networking capabilities, great communication and business relationship skills. You will work as a trusted and integral team member, responsible for retaining and nurturing new and existing client relationships, working alongside the Creative Director and Production Manager. You will understand what the agency does at a high level and be able to ‘talk the talk’, with the highest degree of warmth, enthusiasm and the ability to communicate in a way that the client understands and responds to positively. Forging new business relationships and nurturing existing ones. Understanding the client’s brief/instructions and interpreting it to the design team in a clear and precise way. Leveraging the company’s reputation and professional profile to instil a level of client confidence. Working closely with the Production Manager to ensure client deadlines and expectations are met. Experience in the creative design industry. A proven ability to plan, organise and work within a small team environment. Our Sunshine Coast studio is very well appointed with a team of highly talented designers. Our fast-paced and supportive environment will offer you flexible working arrangements and opportunities for training and development if required.